For centuries, Asian women have relaxed and beautified themselves with exotic therapies derived from the materials of nature; plants, herbs, minerals, clays, and flowers. Until now, Western women could only experience these pleasures by taking expensive trips to professional spas. 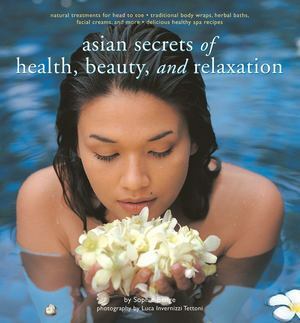 In Asian Secrets of Health, Beauty, and Relaxation, Sophie Benge, an Asian beauty expert, supplies all the tools for experiencing luxurious Asian beauty treatments at home, including inexpensive, easy-to-follow recipes for soothing facials, relaxing aromatherapy baths, invigorating body scrubs, healthy food and drink recipes, remedies for specific ailments, and more. Now readers can spend a lavish day at the spa without leaving their house. All the treatments in Asian Secrets of Health, Beauty, and Relaxation are natural and gentle to the body. readers can lie back and enjoy the benefits of a spa in their own homes.